With the recent storms, especially on the East Coast, you can add one more danger to your list of things to look out for. Looking out on the Delaware River I have recently seen a dramatic increase in the number of submerged objects lurking on or just below the surface. 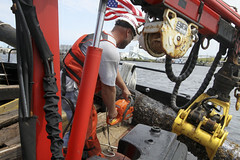 The picture above shows the USCG retrieving and cutting up huge debris found in the Elizabeth River. The fact is that small boats moving at high speeds can be sunk easily by striking a submerged object, whether it’s a tree, parts of buildings, fences, landscape timbers or other debris washed down in recent storms. What’s the best precaution? Slow down after significant rain events and post extra lookouts – the more eyes the better. Any boat is susceptible to these dangers as running gear and outdrives can be damaged and lead to water coming into the boat. Remember, it is supposed to be passengers on the inside and water on the outside. As the days slide farther into fall, recreational boaters face a unique set of safety issues. Warm days collide with deceptively cold waters, greatly increasing the risk of hypothermia even on a “T-shirt” day. Weather can change quickly. And, if you run into trouble, the summer crowds have gone (cue the chirping crickets) leaving few potential rescuers close by. The non-profit BoatUS Foundation has five tips that will help boaters, anglers and sailors understand these unique safety issues and ensure everyone gets home safely. Dress for the water, not the weather: Indian summers can bring T-shirt days and downright balmy temperatures – but don’t be lured into this false sense of summer. The sun may be shining, but water temperatures are cooler. Always bring extra layers and rain gear this time of year. Fast moving storms can bring sudden temperature drops, and water temperatures are now getting closer to the zone where a simple fall overboard could be a big problem. Tell a friend: A floatplan could be as simple as letting a family member know where you are going and what time you expect to return, or a more detailed written plan for longer trips, easily left on a windshield, given to a friend, or dropped off at the Harbormaster office. One piece of floatplan etiquette: always check back “in” upon your return. Always check the weather: “You could be well prepared, however, the one thing that’s out of your hands is the weather,” says BoatUS Foundation President Chris Edmonston. The good news is that with today’s technology, it’s easy to keep an eye on it. Always check the boat: Capt. Rich Lendarson of TowBoatUS St. Joe Michigan reports, ”The majority of small craft that I see in the fall wouldn’t have sunk if owners had checked to see they had a working bilge pump.” Also do a once-over inspection of the engine, communications and safety gear to ensure all are in good shape and ready to go. Leave the drinks for home: Beer, wine or distilled spirits all do the same thing — they quickly drain your body of heat bringing on hypothermia’s deadly effects much sooner when compared to warmer months. Help yourself by avoiding alcohol while you’re out on the water. The following news was released by the USCG. Is it just me or is there something very strange about this story. Hint: There were 2 people on the boat when the man went overboard but he swam 2 miles to shore! JACKSONVILLE, Fla. – The joint search and rescue effort of a missing sail boat captain off the coast of Flagler Beach, Fla., is over after the missing boater swam safely to shore Tuesday. Brian Jeffery Oliver, 45, of St. Augustine, Fla., was reported missing in the Atlantic Ocean approximately two-miles east of Flagler Beach, Monday, after falling overboard from the 22-foot sailboat Cedar Roost. The Coast Guard was notified by the Flagler County Sheriff’s Office at 12:20 a.m., Tuesday, that Oliver was located at a local beach resort after swimming approximately two-miles to shore. Search and rescue controllers at Coast Guard Sector Jacksonville were notified via a mayday distress call of a man overboard at 4:49 p.m., Monday, from a passenger aboard the 22-foot sail vessel Cedar Roost. The report indicated that a rogue wave had knocked Oliver overboard. Two boaters remained aboard the Cedar Roost at the time of the incident. A Coast Guard rescue boat crew transported the remaining boaters to Coast Guard Station Ponce de Leon Inlet in New Smyrna Beach, Fla. The Cedar Roost is currently anchored off the coast. The Coast Guard, Florida Fish and Wildlife Commission and Flagler County Sheriff’s Office were involved in the search. With many duck hunters anxiously preparing for the 2011 Season, the Minnesota Department of Natural Resources (DNR) reminds people to make sure they pack the one thing that could save their lives – their life jackets. “We want all hunters to come back to shore safely,” said Tim Smalley, DNR boating safety specialist. “However, the lack of flotation devices is still one of the most common law violations among waterfowl hunters, and the most common cause of duck hunter deaths. Thirteen hunters have drowned in boating accidents since 1986, when a Minnesota law was passed requiring duck hunters to wear life jackets. “While 13 deaths is 13 too many, before life jackets were mandated, three to six hunters died in duck boat accidents nearly every season,” Smalley said. According to national statistics, more hunters die every year from cold water shock, hypothermia and drowning than firearms mishaps. The most recent Minnesota duck hunter drowning was in 2009, when a 60-year-old hunter, not wearing a life jacket, capsized in a 10-foot john boat and drowned in 5 feet of water in Rat Lake in Becker County. Minnesota law requires a readily accessible U.S. Coast Guard approved life jacket of the proper size and type for every person on duck boats. Plus, for boats 16-feet and longer, one U.S. Coast Guard approved flotation seat cushion must be on board to throw to someone in distress. Seat cushions are no longer approved as primary flotation devices. Life jackets made with the waterfowler in mind are available in camouflage colors, including inflatable life jackets and belt-pack vests. The DNR discourages hunters from wearing hip boots or waders in a boat due to safety concerns. Hunters have drowned while trying to take their waders off after they have fallen into the water or their boat has capsized. “That releases any trapped air in the boots and at the same time binds the victim’s feet together so they can’t kick to stay afloat,” Smalley said. Hunters who choose to wear hip boots or waders in a boat and suddenly enter the water should pull their knees up to their chest, because air trapped in the waders or hip boots can act as a flotation device. “Hunters should practice this maneuver in warm shallow water before they need to do it in an emergency,” Smalley said. Wear a life jacket to and from the blind; there are now life jackets available for around $40 with mesh in the upper body that allow hunters to shoulder a gun but still offer protection from cold water. Don’t overload the boat; take two trips if necessary. Don’t wear waders or hip boots in the boat or at least learn how to float with them on. Stay near shore and avoid crossing large expanses of open water, especially in bad weather. Share trip plans with someone and advise them to call authorities if traveling party does not return on schedule. In case of capsizing or swamping, stay with the boat; even when filled with water; that will provide some flotation and is more likely to be seen by potential rescuers. The DNR has a free publication about waterfowl hunting boat safety called “Prescription for Duck Hunters.” It is available by calling the DNR Information Center at 651-296-6157 or toll-free 888-646-6367, or is also available online. FAIR DISCLOSURE: There was a time (no pun intended), in my younger life, when I was a watch collector. The weirder the better. For every new added feature I had to have one. At the time it really didn’t matter if it told the time. I don’t even want to count the number of watches that I have purchased over the years, especially since I haven’t worn a watch in probably the last 10 years. That said, I’m tempted by the offer that follows. Not because I can’t figure out when the time of tides are going to occur but being able to look at my watch with no additional calculations or research. Oh, and did I mention it is not a watch at all but an Iphone App. The following is information from ChronGlobal which I could not resist sharing. Since the beginning of time, man has been at the mercy of the tides. It is only in the past couple of centuries that we have come to an understanding of this natural phenomenon and become masters of our own destiny at sea. The Lunar Chronoscope follows the daily lunar movements and moon phases in a fascinating way. You can see when the moon is rising and setting as it transits the visible sky. And with a striped moon, you have a depiction when the moon is on the other side of the earth, thereby providing moon ‘under’ as well as moon ‘over.’ All this is accomplished through a GPS based on your location. Yet it is only now, with the advent of a remarkable new application for your mobile device, that professional yachtsmen and mariners of all kinds will be given a freedom and flexibility they have never known before. This remarkable application is the ChronGlobal Tide Chronoscope for your mobile device. It is the first application that tells the tides in the simplicity of a graphic depiction of tide events in a watch format. And it’s no exaggeration to say that it’s going to change the lives of anyone with an interest in water-oriented activity. Not just fishermen, boaters, sailors or mariners. But divers, surfers and even shell collectors. And as one might expect, this Chronoscope provides all the basics of a precision watch. Time is of the essence, and it is ascertained by perfect timing as provided by your device. In hours, minutes and seconds. There is a date display as well. Tap the date display, and date and time wheel appears which you can adjust for future time and date up to 7 day tide prediction. Go to the Info screen and you will see the detailed tide, moon and sun events. Slide this screen and you will see 6 additional tide event details. With the Tidal, Lunar and Solar Chronoscopes, you can choose from several different and attractive dial theme combinations including nighttime and ‘training’ wheels, for understanding the functions. And most of all, of course, the fascinating and ingenious way all the functions are seen in action. All eyes are compelled to turn to the moon or sun disc indicator as it so vividly and graphically demonstrates the tides, moon phases and sun positioning. In short, everything about this App says superb technical integration. Cowes Week is one of the longest-running regular regattas in the world. With 40 daily races, approximately 1000 boats, and 8,500 competitors ranging from Olympic and world-class professionals to weekend sailors, it is the largest sailing regatta of its kind in the world. Having started in 1826, the Event is held on the Solent (the area of water between southern England and the Isle of Wight made tricky by strong double tides), and is run by Cowes Week Limited in the small town of Cowes on the Isle of Wight. “We Were Lost at Sea” For 20 Hours! Reality star Bethenny Frankel and husband Jason Hoppy had to be rescued by the Coast Guard when a giant wave swept their boat off course. Okay, you’ve read the headline and lead-in but the whole story that follows is very strange. I ran across this story by accident but thought it was worth commenting on. The story itself was written by Donna Kaufman and posted on Ivillage.com. I should make clear that in no way am I commenting on the author’s writing or reporting style or the accuracy of the story. I’m simply analyzing the reported series of events as I would if I were asked to testify as an expert witness with a weird sense of humor. While her former castmates on The Real Housewives of New York City were reeling from the recent firings, Bethenny Frankel was reeling from something much scarier: a giant wave that swept her sailboat far off course! The reality star and husband Jason Hoppy were supposed to be on a leisurely eight-hour voyage this past weekend, but instead they spent 20 panicked hours lost at sea. Really, lost at sea! Check out this google map (“A” is Nantucket and “B” is block Island) Once you have looked at the Larger Map hit the back button. “The captain had to call the Coast Guard and we were hit by a big wave,” Frankel tells E! Online. The Coast Guard was called and THEN they were hit by a big wave? “It was very scary. It was traumatic… We were in the middle of the deep sea with no land or anybody near us.” No land or anybody near, check out that google map again. The boat was equipped with a GPS system, but a malfunction left the boat’s passengers clueless about how to get back to land. The “Captain” didn’t know how to get back to land? …Turn north Dude! After hours of drifting between Nantucket and Block Island, the crew was guided back to shore by the Coast Guard at 4 a.m. What, no wind, no engine? All that time, says Frankel, there was only one thing on her mind: her 16-month-old baby Bryn. “I was thinking, Oh, my God, Bryn! I’m not going to be there at six o’clock in the morning when she wakes up and she’s going to wonder where Mommy is and gosh, if something were to happen to me, what would happen to her,” says Frankel. “I was having horrendous thoughts.” So just so I understand, the 16 month old child was left alone asleep and they were worried they wouldn’t make it back until after the child awoke? After what she dubbed on Twitter “the worst night of my life,” Frankel writes that she made it home to enjoy “a quiet morning with Bryn.” But the harrowing adventure should make for a dramatic third season of Bethenny’s Bravo reality show Bethenny Ever After: The entire camera crew was on board the ship with her. Oh!…I got it the entire camera crew was onboard. Enough said. Interestingly enough I just read another story of a guy who was sentenced to 7 years in prison for making a false distress call to the USCG. Hope the reality show’s budget has money set aside to reimburse the USCG for this call and search and rescue.